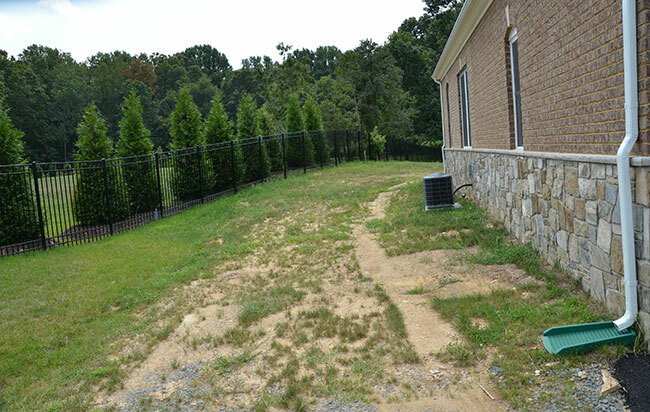 Prior to construction, this backyard had poor soil conditions, making it a challenge to grow plants, and it lacked hardscape or additional structures. The homeowner’s goal was to have entertaining space for family and large gatherings—a space with a modern and contemporary style. They wanted the backyard to have a resort-like feel and include a large pool and pool house, a lush lawn, sculpted and trimmed plants in muted colors with mostly white flowers. Surrounds Landscape Architecture + Construction added two acres of hardscape and planting improvements to the entire property, and its new landscape design, a blend of traditional and contemporary elements, completely transformed the backyard. Natural stone finishes tie the terrace, pool house and pool to the existing home. The paving was laid in a striking running bond pattern with an 8-in. wide border, and the step treads, wall caps, and pool coping all matched, and the linear stone edging at plant beds and continuous masses of planting reinforced the contemporary design. Large evergreen holly and Cryptomeria plantings at the edges of the property provide a sense of privacy. 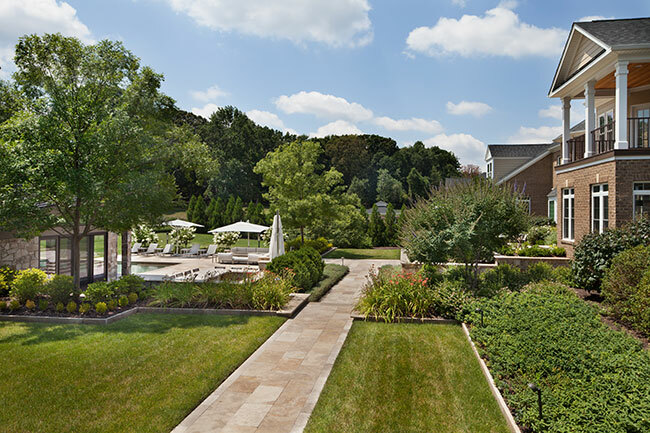 The project earned Surrounds Landscape Architecture + Construction a 2017 Grand Award from the National Association of Landscape Professionals’ Awards of Excellence program. 1. 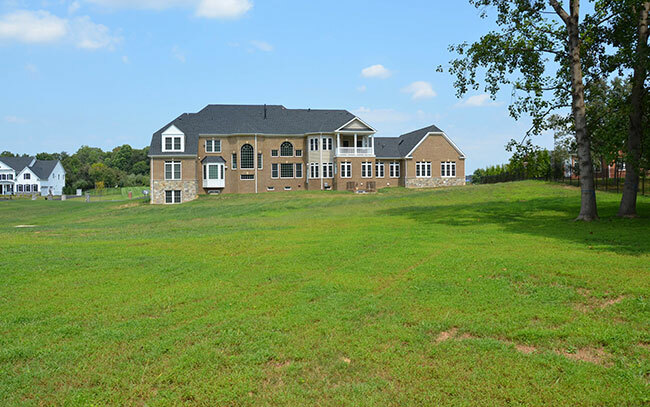 Before (Front): Prior to construction, the landscape primarily consisted of an asphalt drive and minimal sparse planting. The approach to the stoop required visitors to climb several stairs before reaching the landing. 2. 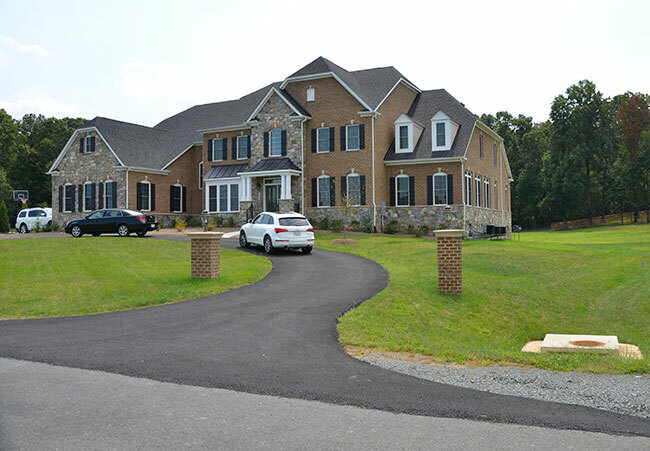 After (Front): The new landscape at the front of the home is comprised of a new concrete paver drive, natural stone retaining walls, and a terraced entry court with lush planting. The terracing allows the approach to the front door to be broken into two smaller, more comfortable sets of stairs. 3. Twilight (Front): Custom LED lighting showcases the home and new landscape with a soft glow and illuminates the paver drive for nighttime visibility. 4. Front Hardscape: The home’s new hardscape blends traditional and contemporary with the concrete paver drive and a generous sized flagstone walk. A new terraced entry court creates a true sense of arrival. 5. Front Hardscape (2): The home’s new hardscape blends traditional and contemporary with the concrete paver drive and a generous sized flagstone walk. A new terraced entry court creates a true sense of arrival. 7. 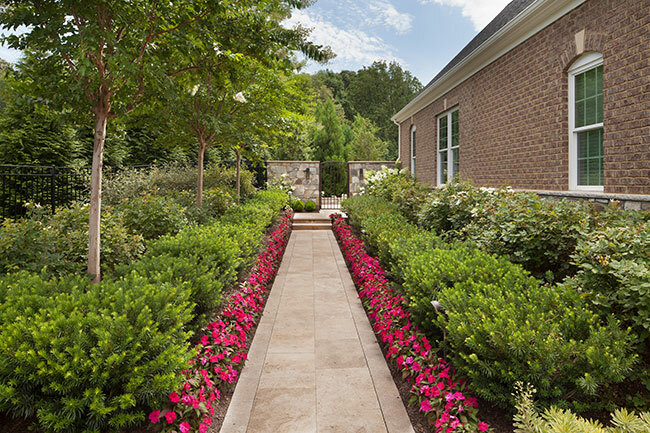 After (Side Yard): Clean contemporary lines and linear hedges formalize the travertine path to the home’s backyard. 8. Before (Backyard): Prior to construction, the home’s backyard completely lacked planting, hardscape, or additional structures. 9. After (Backyard): The new landscape design brought a total transformation to the back of the home with a blend of traditional and contemporary styling. 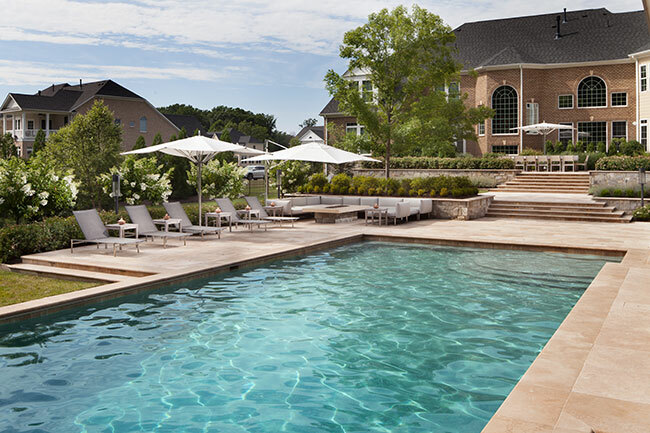 Natural stone finishes tie the new features at the terracing, pool house, and pool to the existing home. 10. Pool Deck and Dining Terrace: The travertine pool deck features a number of amenities to extend the seasonal use of the outdoor living space, including a lounge area with wrap-around modular sofa and custom gas fire pit. Situated closer to the home, the travertine stone dining terrace is suitable for large gatherings and outfitted with teak dining table and chairs for 14 guests. 11. 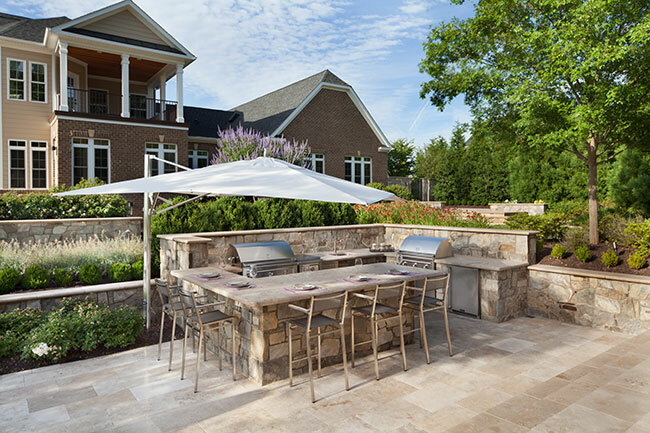 Bar and Grill: The natural stone outdoor bar and grill contains all of the creature comforts. Built-in custom lighting illuminates the space for around the clock entertaining. 12. Backyard Design: The design’s contemporary forms are reinforced with linear stone edging at plant beds and continuous masses of planting. 13. 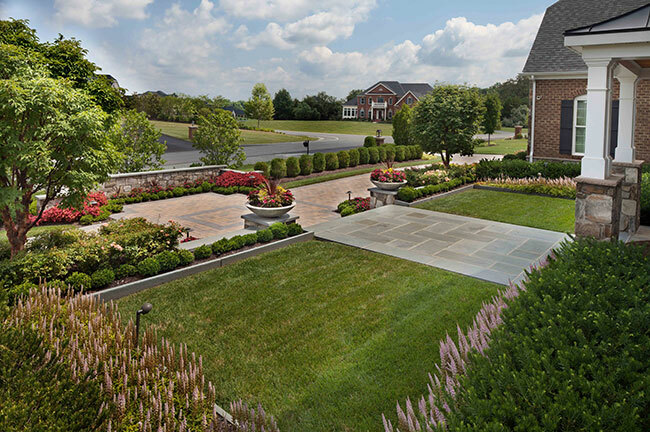 Rear Hardscape: Travertine stone linear paths and flagstone planter walls are softened with lush planting. 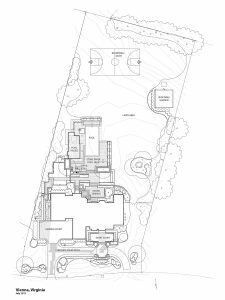 Homeowner’s feel a sense of privacy as they walk through the space with the large evergreen holly and Cryptomeria plantings at the edges of the property. 14. 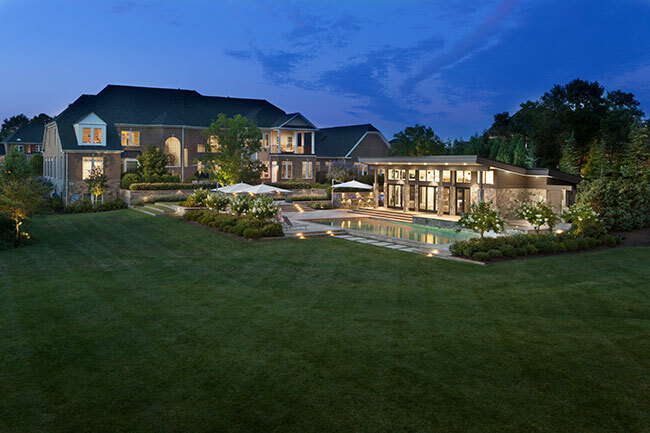 Pool Environment: The travertine pool deck features a number of amenities to extend the seasonal use of the outdoor living space, including a lounge area with wrap-around modular sofa and custom gas fire pit. The spa spills into the pool below via a scupper spillway. 15. Pool House: The contemporary pool house overlooks the pool and travertine pool deck. 16. 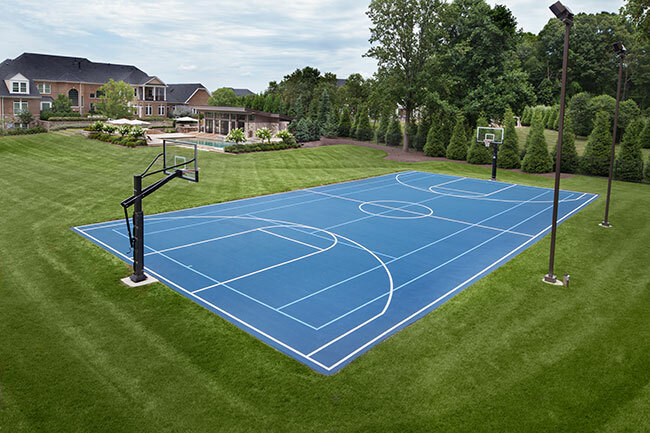 Basketball Court: A full-size basketball court at the rear of the property includes adjustable hoops and ample lighting for nighttime use.